What we believe will happen to our future climate comes from models. The IPCC assessment reports are largely based on model experiments that project our future climate based on different scenarios of changing greenhouse gases. Yet different models don’t always give the same results for climate in the 21st century. As good as they are, there are still many uncertainties. How do we improve the skill with which models’ make predictions? The Jet Propulsion Laboratory is leading a project for NASA that will bring satellite observations into a format that will make them easy to compare with climate models. In collaboration with the Program for Climate Model Diagnosis and Intercomparison (PCMDI) at Lawrence Livermore National Laboratory, JPL has established the Obs4MIPs project, which prepares and hosts observational datasets in the same format as the Couple Model Intercomparison Project 5 (CMIP5) experiment outputs. The CMIP experiment protocol includes hindcast simulations that cover the satellite era. Rehosting NASA data in the same format make it easy for researchers to compare the CMIP model outputs to the observations. The image below shows the air temperature at 850 hPa from a climate model run by the UK Met Office Hadley Center and contributed to the CMIP5 archive. The run was initialized in the year 2000, and simulates the global climate from 2000 to 2010. 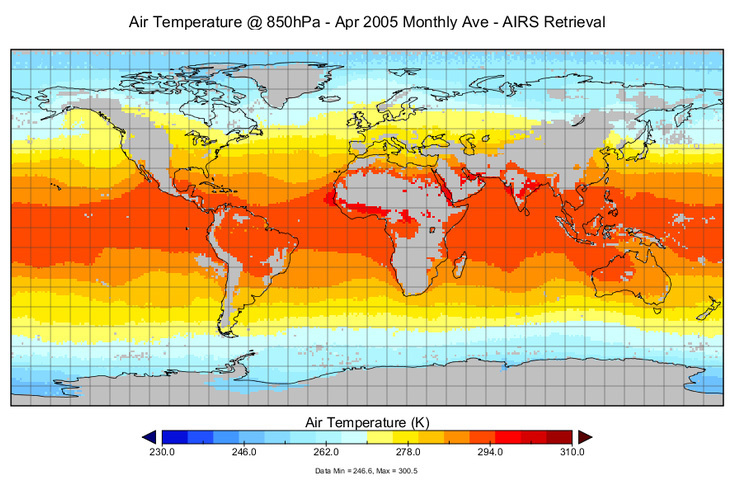 In the image above, air temperature retrievals have been reformatted from the Atmospheric Infrared Sounder (AIRS) instrument so that it matches the model output in the CMIP5 archive. The satellite retrievals are incomplete because clouds and other factors can make the air temperature measurement in unreliable in some locations. But where there are retrievals, not only is there a measurement that can be compared to a model, there is also an estimate of the uncertainty in that measurement that can be useful in diagnosing climate model performance. A comparison between the Hadley Center simulation and the AIRS measurement shows some differences in detail. But after running for five years, the Hadley Center model is doing quite well in reproducing the values and general features of air temperature variation across the globe. Comparisons of snapshots like these don’t mean much by themselves. Climate models are not expected to reproduce exactly the physical observations at a specific place and time. But a decade of observations of a variety of physical quantities formatted in the same manner as climate models make it much easier for scientists to analyze model outputs to determine what they are doing right, and what still needs improvement. The Obs4MIPs project continues to gather observational datasets relevant to climate model analysis from NASA and from other sources like NOAA, DOE, and ESA. We expect this growing collection to be useful to the scientific community in improving climate model performance over the coming years. The air temperature plot for the Hadley Center model output was made using the ta_Amon_HadCM3_decadal2000_r1i2p1_200011-201012.nc data archived in the CMIP5 project on the Earth System Grid Federation. The air temperature plot from the AIRS satellite was made using the ta_AIRS_L3_RetStd-v5_200209-201105.nc data archived in the obs4MIPs project on the Earth System Grid Federation.